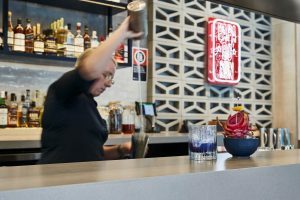 Grosvenor Place talks cocktails and dumplings with Papa Bo Min’s Bar Operations Manager, Kate McGraw. How did your love for cocktails begin? I actually fell into the cocktail world by chance after taking up a bartending job to help pay my rent. I started experimenting with different flavours and spirits whenever I had a spare moment – for me it was the ultimate creative output and that’s where my passion for cocktail mixology really started to take off. Taste – it always comes down to taste. I have a very sensitive but adventurous palate and I love seeking out new and unusual flavours. Generally, my cocktails are based around a flavour or an aroma that is tied to one of my memories, so the creative process is always quite a personal one. Why are cocktails so important at Papa Bo Min? Cocktails are an integral part of Papa Bo Min. It’s a fun, casual venue with a buzzing atmosphere and the cocktail menu has been carefully developed to amplify that vibe. The cocktails are designed to spark conversation and add a theatrical element to the customer experience. What are the main factors to consider for an unforgettable cocktail experience? There are many factors to consider when it comes to cocktails – from the sound of a bartender shaking and a texturally interesting glass, to the visual drama of a garnish, the fragrant combination of aromas and of course, the taste. For me, the most memorable cocktails are the ones that incorporate all five human senses. Dumplings and cocktails are a match made in heaven… why do they go so well together? Dumplings are the ultimate bar food! I think the whole experience of both eating dumplings and drinking cocktails is a social one, something that inspires conversation, even if it’s fighting over the last BBQ pork bun! How do you match your cocktail creations to the menu? I work really closely with our kitchen and the ingredients they’re using. If, for example, the chefs are working on a light, summery menu then we look to work with flavours that aren’t going to overpower what’s hitting the plate. If it’s a winter menu, then we will select bolder, heartier flavours to compliment the food. I also love experimenting with traditionally savoury ingredients like root vegetables and fats, so I always keep an eye on what goodies our chefs are using so I can incorporate that to inspire the cocktail menu. What’s your top pick on a visit to Papa Bo Min? You can’t beat a Mad Hatter cocktail (cognac, tropical fruits, lychee) and a basket of our signature duck and spinach dumplings! What spirits or trends can we expect to see in year 2017? 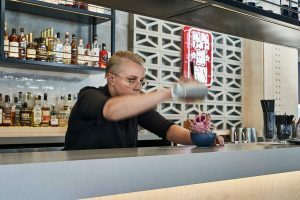 Sustainable bartending is a global trend that is really starting to gain traction through no-waste movements like Trash Tiki. 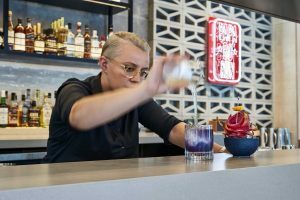 People in the industry are becoming increasingly creative with ways to minimise their excess behind the bar and repurposing the offcuts. In terms of spirits, I think Pisco is having a bit of a renaissance. I also think that a lot more Australian bartenders are starting to favour domestically produced spirits as opposed to imported. I’m very partial to our Dragon’s Jealousy cocktail – Italian aperitif, peach, dragonfruit and yuzu. Shake it up then fine strain into a cocktail glass. We serve ours in a hollowed out Dragonfruit for a bit of theatre!